:: GruvenParts.com Performance Parts for Audi ! We almost always have group buys and specials going on, to get in on the best pricing for these diffs, just email us! We've all used his legendary limited slip differentials for years. GruvenParts.com is proud to team up with Gary Peloquin to become the newest distributor of these great front and rear limited slip diffs for a wide range of vehicles. If you dont already have 1 installed, trust us, YOU NEED 1! These limited slip diffs improve acceleration, braking, and cornering. Win-Win-Win. GruvenParts.com has the best pricing and customer service, please contact us for more info on these great limited slip diffs! We offer the following Peloquin LSD's and some others. Please provide your transmission code and shipping address when inquiring via email. 020 – 80% kit - This kit increases the factory 20% anti torque steer effect to 80%. 02E DSG 2WD and 4WD"
VW/Audi 1.8T/2.0T Billet Intake Links ! GruvenParts.com is proud to announce the release of these billet intake drive unit linkage arms for the VW/Audi 1.8T and 2.0T engines!. Ours are Guaranteed for Life! - Would VW / Audi say that about theirs ??! This GruvenParts.com billet linkage arm replaces the plastic intake manifold linkage arm found on p/n 06J-133-201-AS (06J133201AS) manifold, as well as manifold part numbers 06J-133-201-AL, 06J-133-201-G (06J133201AL, and 06J133201G). As you already know if you are reading this, the OEM linkage arm is made from cheap plastic and becomes very brittle in the engine heat. The linkage arm socket often pops off of the ball on the manifold, rendering the variable intake manifold useless. This in turn causes a check engine light to illuminate as well as poor driveability, reduced power, and reduced fuel economy. Of course VW/Audi will not sell you *JUST* this part, you have to buy and install an entire new intake manifold to replace the cheap plastic linkage arm (with another cheap plastic linkage arm). While the manifold is pricey, the installation of the manifold and the entire manifold gasket set is where it will really cost you – most dealers and shops charge about $1,200 to remove/replace the intake manifold! We think having to pay over $1,200 to replace a poorly designed plastic part on your intake manifold is ridiculous (and that’s putting it nicely). GruvenParts.com is now producing these linkage arms the way VW/Audi should have: from a solid chunk of 6061-T651 Aircraft Grade Aluminum on a 4 axis CNC milling center. Ours come with a special Delrin insert installed into the machined socket to precisely mate with the ball on the intake manifold. This provides excellent lubrication and unmatched strength. Did we mention Ours are Guaranteed for Life! This part can be installed with the manifold on the engine. Unclip the 2 actuator halves and remove the long spring and rubber diaphragm within the actuator. Unclip the useless plastic linkage arm from the manifold ball (if it hasn’t done that on its own already). Reinstall the rubber diaphragm onto our billet link arm, slide it thru the actuator, then firmly snap it onto the ball. Replace the spring and snap the actuator halves together. This should take 10 minutes, and you can do this yourself – no need for $1,000 in labor to replace a whole manifold! You asked us for it and we listened. Another great billet replacement part to rid your VW/Audi of the weak plastic parts! Volkswagen : Beetle, EOS, CC, Golf and Jetta V and VI, Passat B6, and Tiguan 1 and 2 with the 1.8T or 2.0T engine w/ intake manifold p/n 06J-133-201-AS (06J133201AS), 06J-133-201-AL (06J133201AL), or 06J-133-201-G (06J133201G). A3, TT, TT Coupe, TT Roadster 2007-2012 with the 1.8T or 2.0T engine w/ intake manifold p/n 06J-133-201-AS (06J133201AS), 06J-133-201-AL (06J133201AL), or 06J-133-201-G (06J133201G). 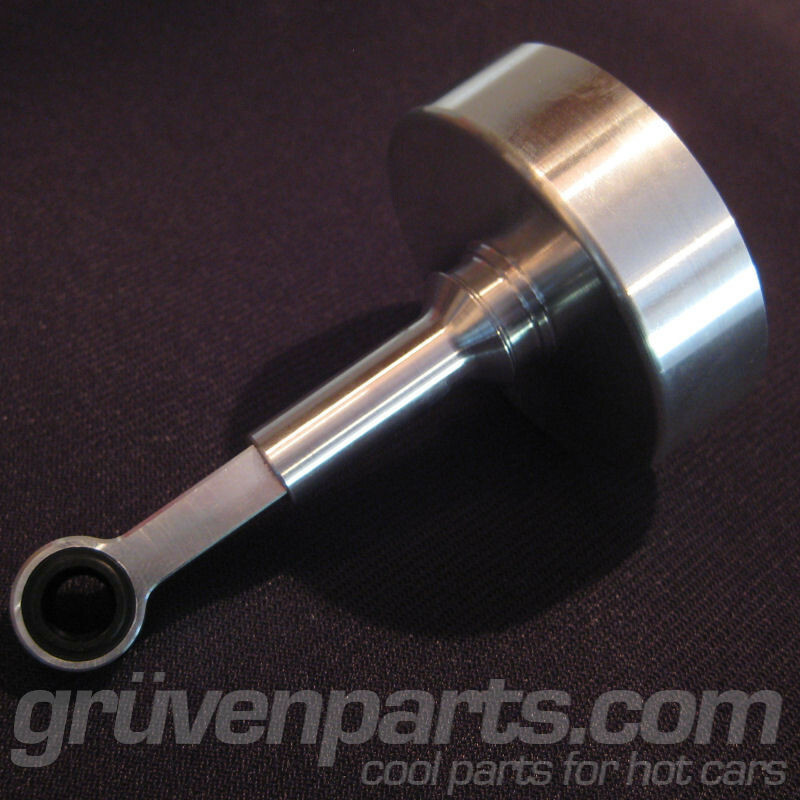 GruvenParts Billet R32/TT Adjustable Front Swaybar Endlinks ! GruvenParts.com is happy to release these Billet Front Adjustable Swaybar End Link sets for the Audi TT MK1 and VW MK4 R32. We start with a center body made from [b]303 Stainless Steel Hex Bar/b] to replace the flimsy non-adjustable OEM spaghetti links. We then add super strong 6,000 lbs radial load capacity THK sealed ball joints with proprietary PEEK liners on either end to provide many years of noise free operation. Our ball joints have a built in dust boots to seal out the elements and do not require any maintenance. These linkages will not deflect under the hardest track corners and will provide the most accurate handling. All center sections are powder coated with a thick layer of either Gloss Black or Bilstein Jazz Blue - please choose during check out. Our design allows simple and quick adjustment on the car. Simply loosen the jam nuts at either end and spin the center body portion to lengthen or shorten, then retighten the jam nuts. This adjustable design will provide +/- 1 inch of adjustment on the car, which is enough to handle all lowered (or raised) set ups. You want the stabilizer bar end links to be as vertical as possible, perpendicular to the swaybar itself to avoid any loading in the fwd/aft direction. GruvenParts Billet MK5 MK6 B7 R32/TT Adjustable Front Swaybar Endlinks ! GruvenParts.com is happy to release these Billet Front Adjustable Swaybar End Link sets to replace OEM P/N's 1K0-411-315R, 1K0-411-315B, 1K0-411-315D, 1K0-411-315J, 1K0-411-315K, 1K0-411-315N, 1K0-411 315P (1K0411315R, 1K0411315B, 1K0411315D, 1K0411315J, 1K0411315K, 1K0411315N, 1K0411315P) for the Audi A3/S3/RS3 (8P and 8V)TT/TTS/TTRS (8J) MK2 and VW MK5 R32, Golf/Jetta MK5/MK6, Passat B7, Eos MKV/MKVI, and Tiguan 1 and 2. We start with a center body made from 303 Stainless Steel hex bar to replace the flimsy non-adjustable OEM spaghetti links. We then add super strong 6,000 lbs radial load capacity THK sealed ball joints with a proprietary PEEK liner on either end to provide many years of noise free operation. The THK ball joints have a built in dust boot to seal out the elements and do not require any maintenance. These linkages will not deflect under the hardest track corners and will provide the most accurate handling. These THK ends are NOT SIMPLY SPHERICAL ENDS. These are tuned specifically for high vibrations found in swaybar end links using a proprietary PEEK liner not found in lessor ball joints. All center sections are powder coated with a thick layer of either Gloss Black or Bilstein Jazz Blue - please choose during check out. Our design allows simple and quick adjustment on the car. Simply loosen the jam nuts at either end and spin the center body portion to lengthen or shorten, then retighten the jam nuts. This adjustable design will provide +/- 1 inch of adjustment on the car, which is enough to handle all lowered (or raised) set ups. You want the stabilizer bar end links to be as vertical as possible, perpendicular to the swaybar itself to avoid any loading in the fwd/aft direction. VW Tiguan 1 and 2. PLEASE CHECK YOUR OEM P/N BEFORE ORDERING TO ENSURE CORRECT FITMENT." Click on the picture to visit our product page for up to date pricing info. CHOOSE POLY-BUSHINGS OR SPHERICAL ROD ENDS !! Got a lowered TT or R32 ? Then you already know how the camber and toe become completely out of sorts, causing poor handling and expensive tire wear the more its lowered. Choose from a zero deflection high radial load PTFE lined inboard spherical joint with protective dust boots preinstalled over specially machined bushings. The fit of the boot over the spherical joint and bushings is nearly water tight! A poly bushing inboard end made from heat treated 4340 forged chromoly housing, thread in grease fitting, zinc plated steel protective sleeves, and race grade greaseable black polyurethane bushings from Energy Suspension. You decide which set up you want ! The zero deflection spherical joints are suited for serious track abuse while the poly bushing ends are better suited for daily drivers. Super strong, heat treated 4340 aircraft grade chromoly rod and ¼” thick U-Joints with machined, internally lubricated (molybdenum disulfide) threads. No weak aluminum is used for these parts (aluminum threads wont hold up). Distinct proper wrench adjustment flats machined into the bars which allow for 2” of length adjustment while on the car. There is no knurled hand adjustment nonsense here, ours are simple to adjust. Thick, durable powder coat finish (and zinc plating on the poly bushing ends) in your choice of high gloss black or Bilstein jazz blue. Made right here in Atlanta, Georgia by our FAA approved commercial aviation machine shop working on state of the art CNC mills and lathes. You wont find many shops working at our level, and you wont find higher quality anywhere ! We know the economy is tough right now, so we are offering these at prices well under our competition. Buy 2 sets and save !!! This product fits Audi TT (2001-2006), Audi A3/S3, VW R32 (2004), VW Golf 4motion and 4motion Variant, VW Bora 4motion and 4motion Variant and replaces P/N 1J0-505-323L (1J0505323L) and 1J0-505-323N (1J0505323N). Need to buy 1 off’s for a project? Want new/longer fasteners? Look below for the parts to get the job done! 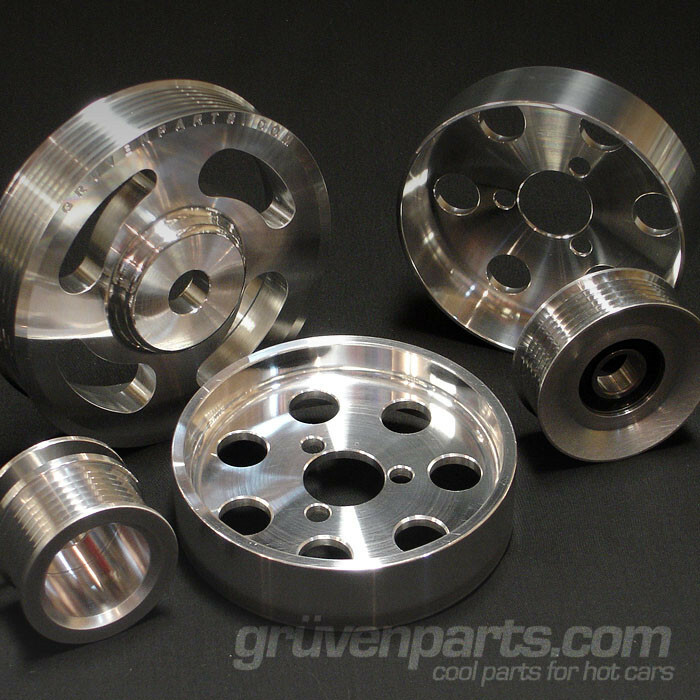 - Headlight Leveling System Bracket"
GruvenParts.com offers a complete set of ultra sleek lightweight 24V VR6 power pulleys. These include lightweight billet crank, power steering, water pump, tensioner, and alternator pulleys for your 24V VR6 engine. These pulleys are precision CNC'd from aircraft grade billet aluminum and reduce the rotating mass by a whopping 8.5 lbs! All pulleys ARE NORMAL DRIVE (NOT UNDER-DRIVE). These pulleys will not change the speed of the supercharger and will not void any supercharger warranties. Buy them as a set and save! Here is another one you guys wanted and we delivered on our promise to make it ! GruvenParts.com is pleased to announce the release of our MKIV VW Golf/Jetta 1.8T and Audi TT MK1 1.8T Billet Y Pipe made from aircraft grade stainless steel to replace the cheap plastic OEM fitting found on hose P/N 1J0-122-109AQ. The OEM plastic Y connector used in this hose has an important task : it connects the coolant reservoir outlet to the turbocharger, with a 3rd connection for the inlet coolant supply. However, due to its location near the turbocharger and hot exhaust manifold, the plastic fitting within the hose quickly dries out and snaps. Just because its a small fitting doesn't mean it wont cause big problems. When it breaks, your engine will experience rapid loss of coolant which can turn your screaming 1.8T into a paperweight. The GruvenParts.com billet 1.8T Y Pipe is machined from Aircraft grade stainless steel, precision bent on a CNC tube bender, then precision welded and pressure tested. You could park the car on this one and it will not break ! Please check your OEM P/N to ensure your vehicle uses P/N 1J0-122-109AQ (1J0122109AQ) before ordering. "Introducing the GruvenParts.com Upgraded MKIV VR6 Intake Manifold Trifecta -- A SURE Bet ! 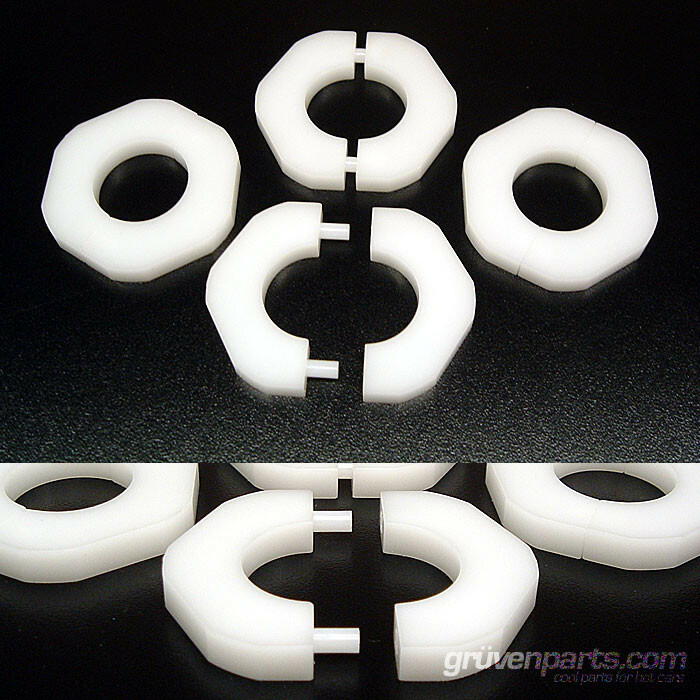 MKIV VR6 Intake Manifold Bushings - 12V and 24V VR6 Engines - Click the Pic ! Unbeatable Tite-Loc bushings are made to precisely mate with your intake manifold and prevent rattles and expensive damage to the manifold bore. Replace the cheap VW/Audi rod bushings with these BEFORE rattling begins to save your upper intake manifold ! MKIV VR6 Intake Manifold Drive Ball - All VR6 Engines - Click the Pic ! A 6061-T651 billet version of the flimsy plastic drive ball which is crucial to your VR6 variable intake manifold system. Don't spend more on a plastic part than the lifetime billet version ! MKIV VR6 Intake Manifold Drive Linkage - All VR6 Engines - Click the Pic ! A 6061-T651 billet version of the flimsy plastic drive link which is crucial to your VR6 variable intake manifold system. Don't spend more on a plastic part than our lifetime billet version !"